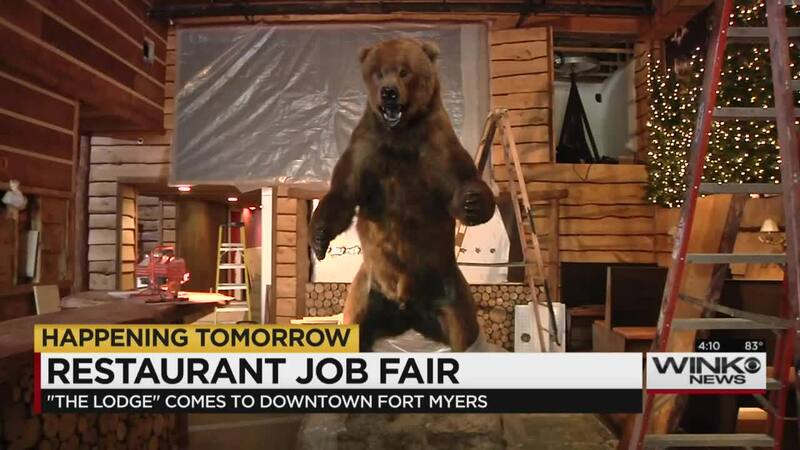 FORT MYERS, Fla.- The sights of a wintry mountain lodge are coming to downtown Fort Myers. The Lodge, a new restaurant and bar will open at the end of April. Only WINK News got a sneak peek. “This is probably one of the most exciting builds we’ve ever done,” said Lance Harmon, General Manger of The Lodge. The owners of The Lodge are calling the $1 million concept adventurous. “Hopefully people will see the value here, they will enjoy that and make their experience that much more enjoyable knowing this wasn’t put together over night,” said Harmon. The Lodge is the newest restaurant by the Kearns Restaurant Group, which also owns Fords Garage and three other themed restaurants in downtown. The Lodge, serving up all American BBQ, will portray a wintry mountain lodge. All of the wood inside was custom cut from trees in West Virginia. When the doors officially open, inside you will see things like a projection wall displaying the scene of what you would see when looking out of a lodge window, a ski lift, and self-serve beer wall. It may even snow. “You purchase your own faub and pour your own beer as you like,” said Harmon. “I see a bright future for them and I’d love to be apart of it,” said Jon Koon. The Lodge says they will be hiring about 100 people. Koon is hoping to become part of the kitchen staff. “It’s going to really do well for the economy, downtown there is always something going on, this is going to add to the fun and excitement down here,” said Koon. The job fair is being held Wednesday and Thursday from 10 a.m.- 5 p.m. They are hiring for all positions. All you have to do is head to Firestone in downtown Fort Myers to apply.